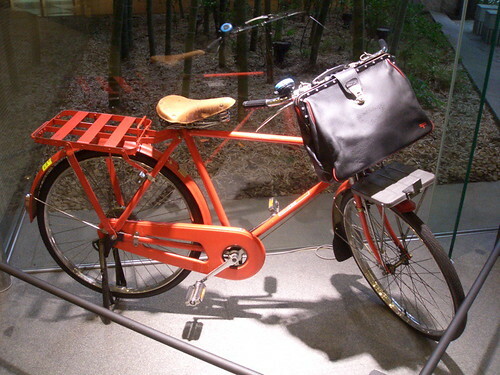 If you visit Japan you’ll be surprised to find that people seldom lock their bicycles. And if they do lock it, it usually won’t be locked to anything in particular. The chain might be snaked through the wheel. But that’s it. And that bicycle can be there, usually near a busy train or subway station, for months, and no one will steal it. Really. But I come from a place where an unlocked bike is as good as gone, and a bike not chained to anything solid just means that the thief will break the lock when he gets home. So even here in Tokyo, out of habit, I lock my bike to a sturdy railing. While growing up in Southern California, I had two bikes taken out of my backyard, and one bike stolen in the few minutes that I left it outside a store while I ran in to do a quick errand. In Oregon, I had, at various times, a seat, a bike light, and a front wheel stripped from my mountain bike, before it was finally stolen out of the back of my friend’s locked pick-up truck. In those days, it was common to quick release the seat and take it with you, after putting the bike chain through the frame and front wheel. So, great, you say. Japan, bike heaven. Well, not quite. A few days ago, after work I went to where I had parked my bike and found that it wasn’t there. I knew it wasn’t stolen. I knew the bike cops took it. Because this is one of the most annoying things about Tokyo: there’s no legal public place to park your bicycle. Some large stations have bike parking lots that are expensive and almost always full. Beyond that, it’s pretty much illegal to park your bike anywhere near a station, or along a busy road, or in the case of my last apartment, right in front of the apartment building. For a country that does a great job of trying to make everything convenient, the bike parking situation is just maddening. Of course, people park everywhere anyway. And we get periodic little warnings attached to our bikes. But every now and then, someone comes through, cuts all the locks if they’re locked and take all the bicycles to a huge municipal impound lot. That’s what happened to my bike. I was lucky that I locked my bike in Meguro Ward because the fee to get your bike back is 3,000 yen or about $27. Other wards charge 5,000 yen, which easily surpasses the worth of most bikes. I went to the impound lot and found a vast multi-storied parking lot filled with thousands of unclaimed bicycles. I explained to the old man working there that my bike was stolen, I mean taken, that day. He lead me to the most recent round-up. I produced my bike lock key to prove that it was my bike. I was directed to the front to fill out paperwork and pay the fine. I had to insert money into a vending machine that produced a receipt. I handed the receipt to another old man who handed it to the clerk. Finally after much bowing and apologizing and thanking, I had my bike. I went there irate and ready to give them my best outraged attitude. But the old guys were very nice. They apologized for the inconvenience, offered to dispose of my dismembered bike chain, and wished me luck to not get my bike seized again. What could I do? I repeatedly bowed and thanked them for each kindness they showed me, paid up and hoped I never had to go there again.